The Midleton Distillery has unveiled Midleton Very Rare 30th Anniversary Pearl Edition; an exclusive, limited edition created to celebrate the 30th anniversary of the expression heralded by many whisk(e)y experts as the pinnacle of Irish whiskey. 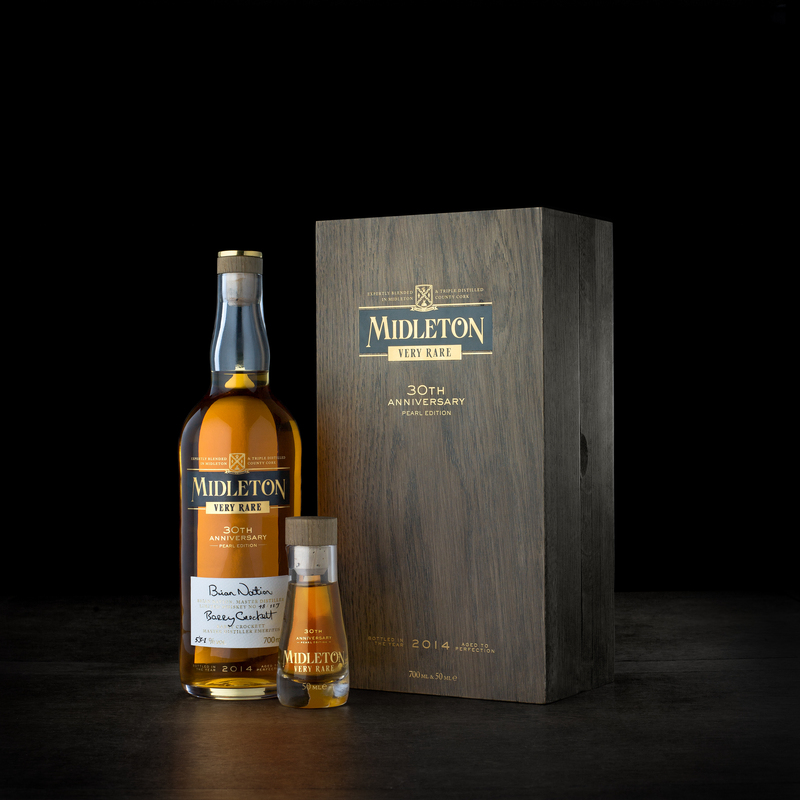 A true Irish masterpiece and a perfectly balanced exemplar of the Midleton Very Rare style, Pearl Edition is the result of a collaboration between Master Distiller, Brian Nation, and Barry Crockett, Master Distiller Emeritus, who share between them more than 60 years’ distilling experience at the Midleton Distillery in County Cork. Barry and Brian personally selected a 1984 Single Pot Still Irish Whiskey and a 1981 grain whiskey respectively to blend into a whiskey of exceptional quality. As is tradition, both whiskeys have been matured in American oak barrels, which after 30 years have imparted luscious vanilla and delicate honey flavours. Local artisans have collaborated to provide exceptional and authentic packaging for the expression, befitting its outstanding quality and rarity. Each presentation pack is bespoke; the Leadbetter family of glassblowers from Jerpoint Glass Studio, Co. Kilkenny, has shaped each bottle individually, which sits in a grand box fashioned from the mightiest Irish oak by some of Ireland’s most-skilled, wood craftspeople from Co. Wexford. The case houses a limited edition, celebratory booklet and a hand-blown miniature of Midleton Very Rare Pearl Edition to allow whiskey lovers to taste and share the whiskey without opening the full bottle. With only 117 bottles in existence, Midleton Very Rare Pearl Edition will be available in Ireland, UK, France, Germany and China, priced at €6,000 or equivalent, from November 2014.